There are no new models at Mitsubishi’s 2019 Bangkok International Motor Show stand, but one display car shined despite being as dark as the night. 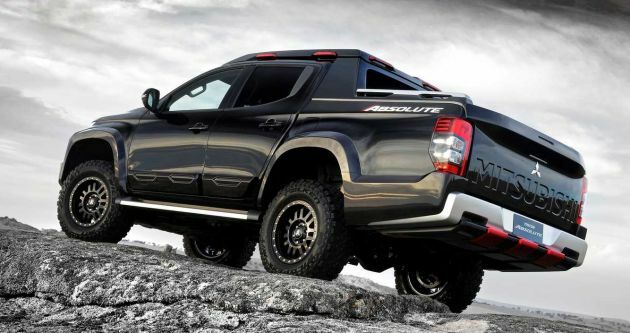 The Mitsubishi Triton Absolute looks super mean, and upon closer inspection, is dripping with carbon fibre body panels. MMC says that the Triton Absolute expresses the concept “Absolutely Beyond Tough through ‘Build-up Robustness’ based on the ‘Truck Dynamism’ illustrated by ‘More Solid and More Rugged’ design and the Triton’s ‘Mechanical Durability’. We’ve never seen so many catchphrases thrown into one sentence, but all is forgiven when you look at the truck. Now, the standard 2019 Triton facelift is already a bold-looking truck thanks to its Dynamic Shield face, but the Absolute takes things to the max. All the chrome bits have been blacked out, except for the required borders of the Dynamic Shield. Elsewhere, you’ll find silver on the front underguards and rear bumper. Three thick stripes of red in front, three at the back, and flashes of it on the roof provide some pop. It’s not apparent at first glance because of the dark theme, but the lower front bumper, overfenders, lower part of the doors and tailgate are all shaped from carbon fibre. The tailgate gets the old school ‘MITSUBISHI’ stamp on it, while the front grille gets a new design. There are also foglamp covers. A big part of the stance is contributed by the wider 18-inch black wheels (with contrasting ‘studs’) wrapped with Falken Wildpeak M/T 285/65 tyres, which are serious off-road items. It’s not very obvious, but there are bigger front brake calipers finished in red as well. Last but definitely not least are the chunky roof rails, which integrate nicely with the sport bar and roof-mounted LED lights. The Mitsubishi Triton Absolute looks absolutely badass, but alas, it’s just a concept truck that will be touring the world in the next 12 months to gauge public interest. Still, it’s good inspiration for those who are planning to mod their Tritons. The post Bangkok 2019: Mitsubishi Triton Absolute, CF bad boy appeared first on Paul Tan's Automotive News. 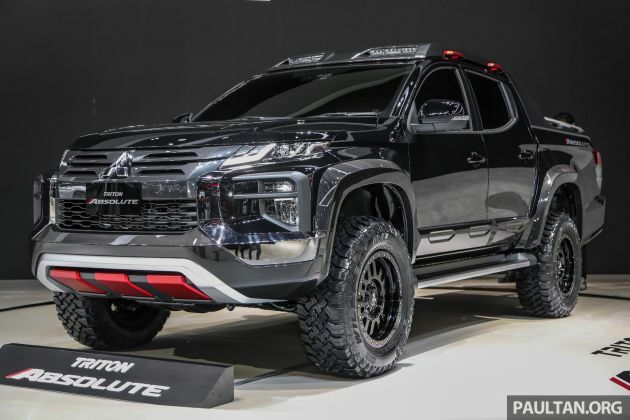 0 Response to "Bangkok 2019: Mitsubishi Triton Absolute, CF bad boy"